Time, allowing time in which to heal. Vitalism. There is a life force within each of us. This force helps us heal ourselves. 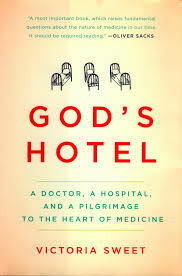 These are some of the ideas/topics that Dr. Victoria Sweet writes about in her book GOD’S HOTEL. Here is several paragraphs from her book. “The mechanists believed that life was mechanical, simply a series of processes that science could eventually understand and duplicate; the body was a machine that could be fixed. For the vitalists, the body was not a machine. They believed that life had something special about it that science could never duplicate. The vitalists were the romantics of medicine, and in the last decades of the nineteenth century they lost their battle with the mechanists. By the early twentieth century, any reference to vitalism or the healing power of nature was considered heretical. Yet vitalism did not disappear. Instead, it dived down into the subterranean rivers of Western medicine and reappeared in the many side streams of alternative medicine. If this sounds interesting to you, I encourage you to pick up the book at your library, at a bookstore, or online. To me, Dr. Sweet expressed a deep caring and concern for the individual, and how they heal. So similar to how homeopathy focuses on the individual – their needs, their suffering, and their healing. Categories: classical homeopathy, Dr. Victoria Sweet, GOD'S HOTEL, Vitalism | Tags: Dr. Victoria Sweet, GOD'S HOTEL, Hildegard, homeopathy, Laguana Honda Hospital, vis medicatrix naturae, vitalism | Permalink.